With the RP Fiber Power software, one can investigate many details of mode locking. Different kinds of saturable absorbers can be considered, even in combination. Dr. Paschotta, the developer of that software, is a leading expert in this area, and personally delivers the technical support. The general aspects of the generation of ultrashort pulses by mode locking are discussed in the article on mode locking. This article focuses on passive mode locking, which can be achieved by incorporating a saturable absorber with suitable properties into the laser resonator (Figure 1). However, incorporation of the absorber may also lead to passive Q switching, to Q-switched mode locking, or to some noisy mode of operation, if the absorber properties are not appropriate. Figure 1: Schematic setup of a laser which is passively mode-locked with a saturable absorber mirror, e.g. a SESAM. In the following, the steady state is considered, where a short pulse is already circulating in the laser resonator. For simplicity, it is assumed that there is a single circulating pulse (i.e. fundamental rather than harmonic mode locking), and a fast absorber (see below for details). Each time the pulse hits the saturable absorber, it saturates the absorption, thus temporarily reducing the losses (Figure 2). In the steady state, the laser gain can be saturated to a level which is just sufficient for compensating the losses for the circulating pulse, whereas any light of lower intensity which hits the absorber at other times will experience losses which are higher than the gain, since the absorber cannot be saturated by this light. The absorber can thus suppress any additional (weaker) pulses in addition to any continuous background light. Also, it constantly attenuates particularly the leading wing of the circulating pulse; the trailing wing may also be attenuated if the absorber can recover sufficiently quickly (see below). The absorber thus tends to decrease the pulse duration; in the steady state, this effect will balance other effects (e.g. chromatic dispersion) which tend to lengthen the pulse. Figure 2: Temporal evolution of optical power and losses in a passively mode-locked laser with a fast saturable absorber. The shorter the pulse becomes, the faster will be the loss modulation. The gain stays approximately constant, as gain saturation is weak. Compared with active mode locking, the technique of passive mode locking allows the generation of much shorter pulses, essentially because a saturable absorber, driven by already very short pulses, can modulate the resonator losses much faster than any electronic modulator: the shorter the circulating pulse becomes, the faster is the loss modulation obtained. This holds at least for the leading wing of the pulse, where the absorber is bleached, whereas absorber recovery may take some longer time. In many (but not all) cases, the saturable absorber can also start the mode-locking process. If the pulse generation process begins automatically after switching on the laser, this is called self-starting mode locking. Usually, the laser first starts operation in a more or less continuous way, but with significant fluctuations of the laser power (→ laser noise). In each resonator round trip, the saturable absorber will then favor the light which has somewhat higher intensities, because this light can saturate the absorption slightly more than light with lower intensities. After many round trips, a single pulse will remain (principle of “the winner takes all”). However, self-starting is not always achieved. Generally, slow absorbers are more suitable for self-starting mode locking than fast absorbers. For example, Kerr lens mode-locked lasers are often not self-starting; they run in continuous-wave mode after turning on, and start mode locking only when the user knocks against a resonator mirror. Self-starting may be inhibited e.g. by parasitic reflections in the resonator, by mode pulling effects (which can be related to, e.g., spatial hole burning in the gain medium), or by chromatic dispersion. If the absorber recovery time is well below the pulse duration, the absorber is called a fast absorber. In that case, the loss modulation basically follows the variation of the optical power. However, mode locking can also be achieved with a slow absorber, having a recovery time above the pulse duration (see Figure 3). Figure 3: Temporal evolution of optical power and losses in a passively mode-locked laser with a slow saturable absorber. The saturable absorber causes a loss modulation which is fast for the leading wing of the pulse, whereas recovery of the absorber takes some longer time. It turns out that e.g. in a solid-state laser mode-locked with a slow absorber, there is a temporal range with net gain just after the pulses, where the absorber is still in the saturated state. One would normally expect that such a situation can not be stable, because any noise behind the pulse should exhibit exponential growth of its energy, sooner or later destabilizing the pulse. However, both experimental observations and numerical simulations indicate stability even in situations where the absorber recovery time is more than an order of magnitude longer than the pulse duration. An explanation for that mystery was first found in the case of soliton mode locking , but unexpected stability had been observed also in simple cases without dispersive and nonlinear effects; that could also be demonstrated with numerical simulations. Finally, in 2001 a subtle mechanism was found to be responsible for the stability : the stronger absorption for the leading edge of the pulse constantly delays the pulse (i.e. shifts the position of the maximum), but not the noise background, so that the latter has a limited time for exponential growth. Based on that analysis, a limit for the allowable absorber recovery time could be derived. Other saturable absorbers for mode locking are based on quantum dots, e.g. of lead sulfide (PbS) suspended in glasses. Doped-insulator saturable absorbers, as often used for passive Q switching (e.g. Cr:YAG), usually have a too slow recovery for mode locking. There are also various kinds of artificial saturable absorbers, based on, e.g., nonlinear phase shifts (→ Kerr lens mode locking, additive-pulse mode locking, nonlinear polarization rotation) or on intensity-dependent frequency conversion (nonlinear mirror mode locking ). In the picosecond regime of pulse durations, chromatic dispersion usually has only a weak effect. Nonlinearities, in particular the Kerr effect, can be significant, depending on parameters such as the length and material of the laser crystal, the mode area at that place, and the pulse energy and duration. For femtosecond pulse generation, it is usually required to arrange for dispersion compensation, for example with a prism pair, as shown in the article on mode-locked lasers, or with dispersive mirrors. In many cases, a laser is operated in the anomalous dispersion regime, where the circulating pulse can be a quasi-soliton; this is called soliton mode locking. In the few-cycle pulse duration regime, with ultrabroad pulse spectra, precise compensation of higher-order dispersion is required. The effects of nonlinearities, in particular of the Kerr nonlinearity, can also be very important in femtosecond lasers. Excessive nonlinear phase shifts can destabilize the pulses or limit the achievable pulse durations. On the other hand, they can play a useful role in soliton mode locking. In fiber lasers, the fiber nonlinearity is often stronger than desirable and thus often limits the achievable pulse durations and/or pulse energies. 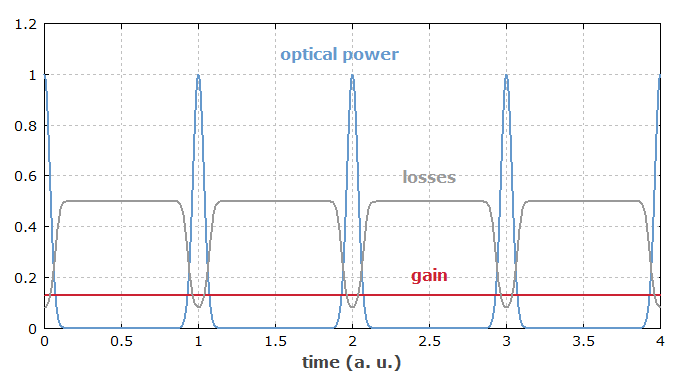 Gain saturation during the pulse can be significant in dye lasers and semiconductor lasers, but not at all in doped-insulator solid-state lasers. In the former cases, significant chirp of the pulses can be a consequence. Also, stabilization of the pulse energy by gain saturation is strong in dye lasers and semiconductor lasers, but very weak in solid-state lasers. The Kerr effect and the effect of chromatic dispersion can be negligible in picosecond lasers, particularly for those with multi-gigahertz repetition rates, but very strong in femtosecond lasers, particularly in fiber lasers. Both can play a very useful role in soliton mode-locked lasers, whereas much smaller nonlinear phase shifts can have a destabilizing effect in lasers without intracavity dispersion. In some mode-locked lasers, the pulse duration obtained depends strongly on the parameters of the saturable absorber. For others (e.g. soliton mode-locked lasers), this influence can be weak, because the absorber plays only a stabilizing role, but is not dominant for pulse shaping. A comprehensive understanding of the pulse formation and shaping processes is essential for good laser design, with which the best possible performance is achieved. For the detailed study of pulse shaping in mode-locked lasers, numerical pulse propagation modeling can be very useful. 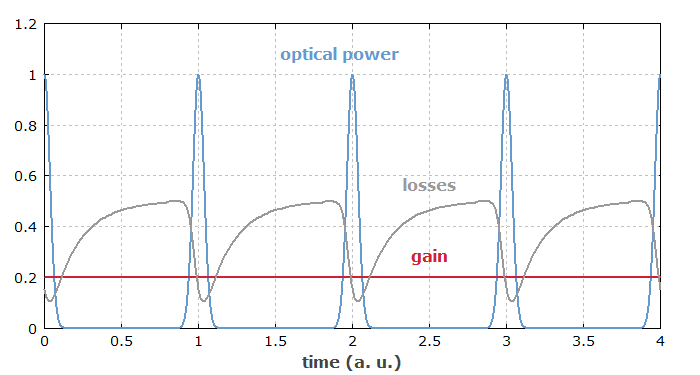 In simple SESAM mode-locked lasers particularly in the picosecond regime, the pulse duration often results from a steady state between gain narrowing and the pulse-shortening effect of the SESAM absorber, which itself depends on details such as modulation depth and degree of saturation. The pulse duration is then inversely proportional to the square root of the ratio of round-trip gain and modulation depth , also inversely proportional to the gain bandwidth. In the femtosecond regime, the situation is usually further complicated by the influence of chromatic dispersion and nonlinearities. A common technique is (quasi-)soliton mode locking, where the pulse duration is largely determined by the balance of dispersion and Kerr nonlinearity, without a significant direct influence of the gain bandwidth. The pulse duration can then be reduced by reducing the amount of anomalous intracavity dispersion, provided that the circulating pulse stays stable. The stability limit and thus the achievable pulse duration depends on the gain bandwidth, but also on the total intracavity losses, the strength of nonlinearities and other factors. In mode-locked fiber lasers, often utilizing more complicated pulse formation mechanisms, the achievable pulse duration may also be strongly influenced by nonlinearities and by higher-order chromatic dispersion. The shortest pulses generated directly with a passively mode-locked laser have durations around 5.5 fs (see the article on ultrafast lasers). External pulse compression allows for significant further reductions. Under certain circumstances, Q-switching instabilities can occur, because the saturable absorber usually “rewards” any increase in the intracavity pulse energy above its steady-state value with reduced losses, so that the net gain becomes positive and the pulse energy can rise further. The situation becomes unstable if gain saturation is not strong enough to counteract the destabilizing effect of the absorber. Q-switching instabilities (or Q-switched mode locking) can usually be suppressed by observing certain design guidelines, but in certain parameter ranges – for high pulse repetition rates, in particularly in combination with short pulses or high output powers – this can be challenging. There is also a range of other types of instabilities, which can be related e.g. to excessive nonlinearities, to an inappropriate degree of absorber saturation, to too slow absorber recovery, to higher-order dispersion, to parasitic reflections, or to inhomogeneous gain saturation. It is not always obvious which of these instabilities is at work, but the required measures usually depend strongly on that. 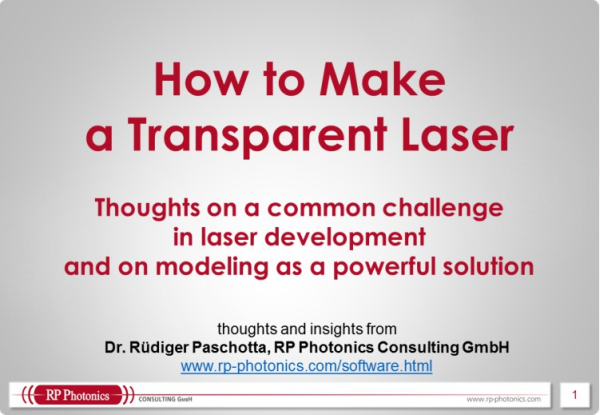 Optimum design of a mode-locked laser, particularly for operation in extreme parameter regions, must be based on a thorough understanding of the relations between various parameters and effects occurring in such lasers. Figure 4 shows such relations for passively mode-locked lasers in a very simplified form. For example, a high modulation depth ΔR of the saturable absorber (SESAM) normally leads to shorter pulses, but also to an increased tendency for Q-switching instabilities or Q-switched mode locking, and to a reduced power efficiency. 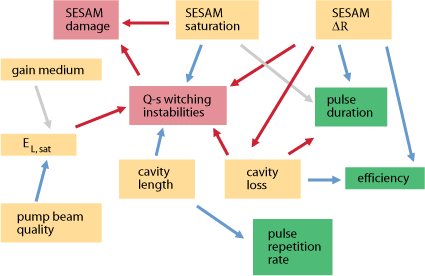 Q-switching instabilities are related in various ways to SESAM damage, and can be suppressed in various ways. A thorough understanding of all these relations often allows one to “shift” the problems to a location where they are much more easily solved. For example, SESAM damage issues, which originally sometimes occurred even for fairly moderate output powers, have been solved essentially not by developing SESAMs with higher damage thresholds, but rather by optimizing the overall laser design. This allowed the generation of very high output powers  without putting the SESAM under excessive stress. Figure 4: Simplified sketch of the relations between various parameters and effects in a passively mode-locked laser. Red arrows indicate positive relations (more of X leads to more of Y), whereas blue arrows represent negative relations. A comprehensive understanding of all these relations is required for good laser design, particularly for operation in extreme parameter regions.